BEVERLY HILLS, California—anny Pacquiao and Timothy Bradley Jr. both realize almost every boxing fan wishes Floyd Mayweather Jr. had been standing next to Pacquiao at the Beverly Hills Hotel on Tuesday. But when Pacquiao and Mayweather failed to make a deal for the fight everybody wants to see, Pacquiao moved down the list of contenders to make a fight he hopes his fans will enjoy. Pacquiao and Bradley are getting an early start on the promotional circuit for their welterweight bout June 9 at the MGM Grand Garden in Las Vegas. Even while the Filipino congressman and his unbeaten opponent posed for photos and praised each other in the peach-colored ballroom at the historic Hollywood hideaway, Pacquiao and his camp realized Mayweather's absence looms over the proceedings. "I'm willing to fight Mayweather," Pacquiao said. "But I have to fight the guys who are hungry to fight me. Timothy Bradley is strong, and he can punch. He's a good boxer, so it's a challenge to fight a guy like that." Pacquiao (54-3-2, 38 KOs) realizes he'll have to do plenty of promoting to get fans interested in a fight against Bradley, a 140-pound (63.5-kilogram) champion from Palm Springs, California, who has never been in a fraction of the spotlight that follows Pacquiao across the globe. Pacquiao will make sure every fan knows all about Bradley (28-0, 12 KOs), praising him as a game opponent who enjoys a good action fight as much as he does — another indirect swipe at the defense-oriented Mayweather. "It's nice to be fighting a fighter who is undefeated and not worried about losing that zero on his record," said Freddie Roach, Pacquiao's longtime trainer. Yet Roach repeatedly showed little interest in a bout with Bradley in recent years, citing Bradley's near anonymity and limited knockout power. Although Bradley's record makes him an eminently worthy opponent, he only pulled into prime position for the bout last year when he joined promoter Bob Arum's Top Rank alongside Pacquiao. Pacquiao and Bradley haven't exactly built up any motivation to punch each other in the face yet, either. 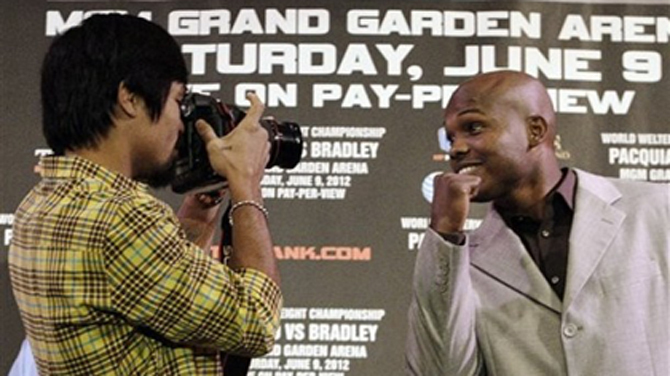 After Pacquiao cracked up in laughter when he posed for a staredown with Bradley, the Filipino champion grabbed a camera and shot a few photos of Bradley, who struck a goofy pose. Pacquiao is "probably the best fighter in the history of boxing," said Bradley, a physical boxer best known for using his shaved head as a battering ram to get inside on his opponents. "He's a great role model, a great guy, but Manny Pacquiao has reigned for a long time, and I really feel like I'm the new face of boxing." Boxing could need a new face as soon as next year. Mayweather has fought sparingly in his 30s, and Pacquiao says he'll consider retirement in November after his next two bouts. Pacquiao cites a renewed religious fervor for his interest in retirement, saying he's no longer comfortable pounding on his opponents while winning his last 15 fights. Roach said Pacquiao's last training camp "fell apart" in its final days because of numerous distractions including friction between Pacquiao and his wife, Jinkee, resulting in a mediocre performance in a narrow victory over Juan Manuel Marquez. "He says God doesn't want him to hurt people," Roach said. "That bothers me a little bit, but Manny has always been a compassionate person." Even while hyping his bout with Bradley, Pacquiao knows everybody will ask him about the potential of a Mayweather fight in November. Even his 11-year-old son, Emmanuel Jr., is on his dad's case. "My kids request me: 'Dad, I want you to retire, but before, you have to fight Mayweather and beat him,'" Pacquiao said with a grin. Pressed for details about the breakdown in negotiations with Mayweather, Pacquiao said he was willing to fight for a 50-50 split of all revenue from what's likely to be the richest fight in boxing history. Pacquiao recounted his phone conversation with Mayweather several weeks ago, with negotiations falling apart afterward. "I was in the Philippines, and I told him, 'We need to make this fight happen,'" Pacquiao said. "I said I would agree to a 50-50 (split), and he said, 'Oh, I'll give you a $40 million guarantee, and no pay-per-view. I'll take all the pay-per-view.' I don't accept that offer. It's kind of embarrassing to me. It's trying to take advantage of me. He doesn't want to fight." That $40 million might sound like a fortune, but a Pacquiao-Mayweather fight is expected to produce more than $150 million in pay-per-view proceeds alone.